Sit back, relax and take in the gorgeous views of Canyon Lake with the SWVCC and PMCC. During this one-and-a-half-hour, six-mile cruise, you may see desert bighorn sheep, bald eagles and a host of other animals and local wildlife viewed from the decks of the Dolly! We also touch on the beautiful flora from the stately Saguaro cacti to the microscopic organism called desert varnish. Discover why there’s more to Arizona than just desert on this spectacular Canyon Lake cruise. You never know what you might learn about Canyon Lake, Tortilla Flat and the surrounding area aboard the Dolly. 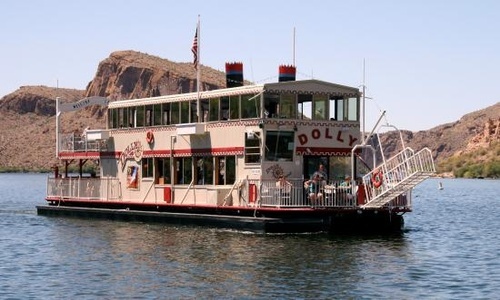 Book your Dolly steamboat cruise now at seating is limited.